In just her second ever triathlon, Tracy ticked off a number of massive goals at the Mooloolaba Triathlon. Stopping the clock in 2:10:20 over the standard distance Tracy finished the day 7th female overall being beaten only by 6 professional athletes on her way to first age grouper, 30-34 national champion and automatic qualification for her Triathlon Australia elite license. Being the Junior Oceania Championships meant this year’s junior race in Devonport was as hotly contested as ever. After not racing at Runaway Bay and a somewhat disappointing result in Canberra by her high standards, Elle had a lot of work to do in Devonport to be competitive in the junior series. A cracking swim - bike set the scene for Elle to cross the line with the bronze medal in both the Oceania Junior Championships and the Australian Junior Series for 2019. After an 18 month hiatus from the sport, the 2018 World Champs was the race that put the 20-24 female age group on notice, Grace was back! After leading out of the water by 90seconds, Grace came off the bike in 2nd place and went to work on the run before being joined by 2017 16-19 World Champion Izzy Chisholm 5kms into the run. The 2 ran side by side until 1km to go when Izzy’s run legs got the better of Grace and she fell to 5th place on the blue carpet. Grace’s 5th place her second best result ever at a world champs and a springboard into the rest of the 2019 season. 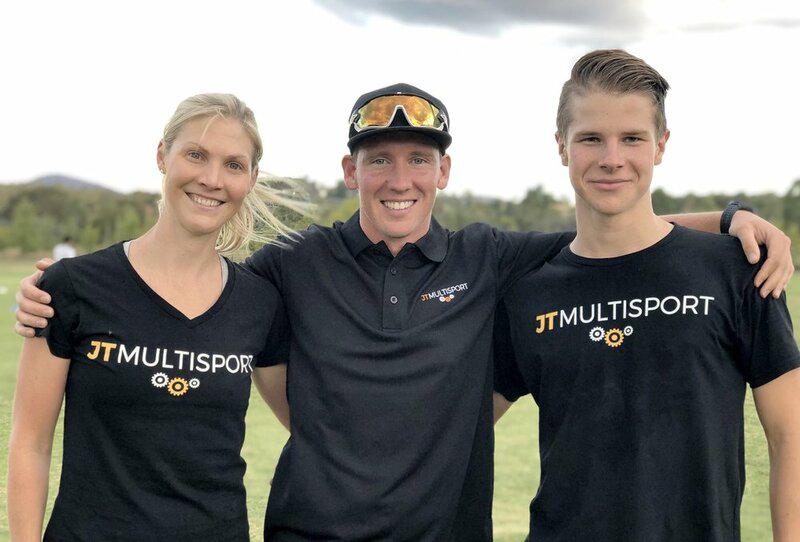 Shelby’s finish at Western Sydney in November barely left a dry eye in the JT Multisport camp. After being told by doctor’s she would never walk again at age 18, in typical Shelb fashion she resolved to one day do an ironman event. It would be Shelb’s fearless determination and the loving support of her family that got her through the last 10kms of her run at Western Sydney 70.3 and down the finish line in what was one of JTM’s most memorable finishes of the year! After making a return to racing in Kurnell in November, Jo’s season of sprint distance racing placed her firmly as one of the best in Australia for her age group. No race stood out more for Jo this season than Big Husky. After exiting the water in 8th position in her age group and very much in contention, Jo tore her way through the field on the bike and run to finish in 1:15:46 and take the age group win in one of the most hotly contested categories in the race! To say Yoann has had a breakthrough season would be an understatement. In looking through his long list of accomplishments this year, the Mooloolaba triathlon stands out. This was the race where Yoann showed off his ability in all three disciplines and proved to everyone he could match it with some of the best in the sport finishing his first standard distance race in 1:56:07 in 10th place overall and in doing so beating half the pro field, winning the 20-24 national title and earning an automatic right to his Triathlon Australia elite license. Kerryn’s natural talent in the sport of triathlon has been on display all season. After completing his first ever triathlon at Husky, Kerryn headed back to QLD to take part in the Tinaroo Sprint Distance Triathlon. It was this race which allowed Kerryn to really show off his bike and run ability laying down the second fastest split in each leg to finish third place overall in 1:11:44. This result also gave Kerryn the 30-39 age group win and most importantly, the bragging rights over his parter Megan who won the women’s race. Thank you for your vote. Award winners will be announced May 17th.